Eliminate ugly toner cracking when folding digitally imaged documents by creasing, then folding. Impact creasing utilizes a blade rule and matrix to compress the fibers of the paper as well as the toner image to eliminate cracking. Choose a desk top creaser for quick small jobs, an auto-feed creaser for large jobs or the complete solution: the Digifold which combines creasing and folding in one machine. 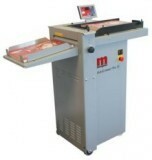 Crease and fold up to 150 lb. cover stock! Download Morgana's Complete Finishing Range Brochure.